HAVING developed and maintained its brand for quality and experience in the Asian region successfully over the past three years, CaliBurger is banking on its experiences to do well on Malaysian soil when it opens, in the near future. With its RM4 million plans, including marketing spend, to open its first outlet within the first two quarters of 2015, CaliBurger’s marketing strategy which includes pop-up experiences of the brand, dining experience and promoting quality products will take the lead in its recipe for success. CaliBurger global chief executive officer (CEO) Silas Adler shared how each new market presents a new challenge for the brand but taking pointers from its two biggest markets — Hong Kong and Shanghai — that contribute up to 70% of its global revenue; the brand is comfortable to plug-and-play anywhere and drive traffic through.“Our marketing strategy in Malaysia, based on previous experiences, would be localised social and video-wall content through local artists, musicians and celebrities, and done in a way that resonates with the local crowd. 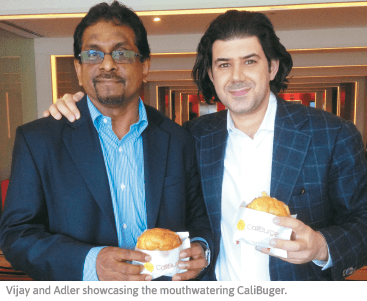 “There are also pop-up events that are held very closely before the store launches that serve to start seeding the product perspective with the people and get them excited,” Adler shared at the signing event with CaliBurger Malaysia. Malaysia is the eighth country outside of the United States that CaliBurger has expanded to. Another proven strategy is CaliBurger’s application of social media marketing which Adler said there is a direct co-related spike in sales with activities. CaliBurger Malaysia CEO Vijay Chinnasami elaborated that while the company has internal plans of hitting its targeted position in the next four to five years, he remains confident that Malaysian CaliBurger outlets have the advantage of doing better than Hong Kong through aggressive marketing plans and the opening of the outlets within the next year. Positioning its price range and concept between the typical fast-food burger outlets and a gourmet one, CaliBurger will pride itself on the Californian sunrise or sunset lifestyle experience that it would offer customers, and the quality of its product. “I’d like to say that our price range would be within the mid-RM20 bracket, as we would like to make ourselves affordable for the masses,” Vijay assured. Adler compared where Californians would “walk in, eat and then go,” at a burger place up to few times a week, the foreign markets shift to more of an “aspirational” experience-driven focus, where customers tend to linger at least 45 minutes and above at one dining session. Further distinctions include a trim made-to-order menu with options as add-ons, as well as a promise to still deliver fast enough within eight minutes — from order at the counter to serving at the table. Applying a proven system to cater to its “simple menu” concept, CaliBurger will practise its standard of imported meat from Australia and has identified local suppliers to provide other produce, including vegetables when its doors open. Its core menu will also be supplemented by seasonal specials catered to Malaysian tastes, as Adler reiterated is crucial for success in the local market. In deliberating its first Malaysian venue, Vijay said CaliBurger Malaysia is in negotiations and discussions for a suitable location but “we’re looking at higher-end and more established malls to kick-start our operations but we want to focus on our Klang Valley outlets and make sure we do a good job before expanding nationwide”. Franchising opportunities remain in the pipeline and enquiries have already been streaming in, Vijay said, but the emphasis for partnership will be on service and product quality. “We don’t want to be too aggressive on expansion because while it may be financially beneficial, we refuse to compromise on quality service and quality product. Partners will also have to share the same culture and a vision that is aligned to ours and the brands. “The food and beverage experience would add value to the partnership but it is not as critical as sharing the same culture and vision,” he added. This article first appeared in The Edge Financial Daily, on December 9, 2014.